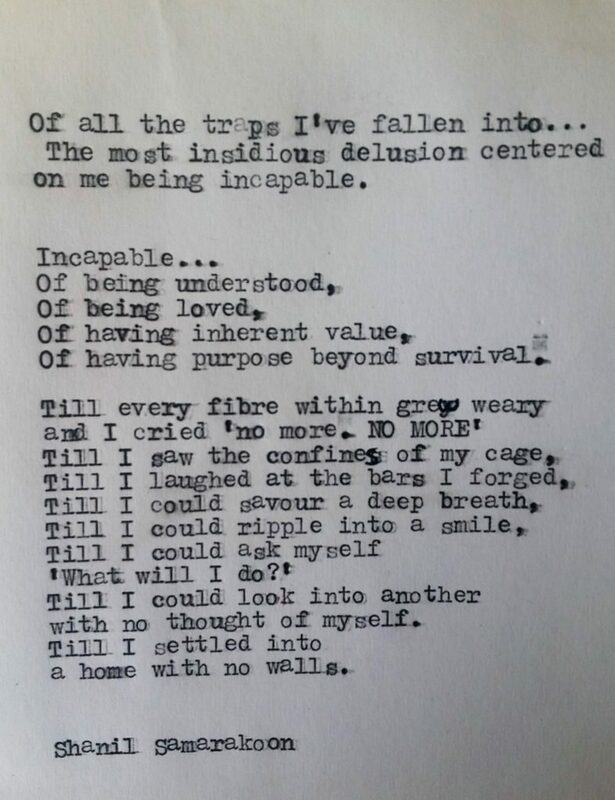 consumed by a sense of futility. reduced to embers of old intent. the vitality of building community. 2016 was bittersweet. It is a sentiment I have heard and read many people express over the last few days. I am admittedly not one that indulges in new year celebrations and resolutions, but I have felt a pull to reflect on what has been a defining year. For me, there was the joy of marrying my beautiful partner Sophie and being able to celebrate our union with family and friends. It was without question the pinnacle of the year. Furthermore, I've thoroughly enjoyed teaching, writing and playing an active part in supporting a range of community initiatives. I feel I am acutely aware of how privleged I am and I hope I never lose sight of the responsibility that comes with it. However there's no denying that events (and non-events) across the year have cast a long shadow across my heart. Between the dire lack of action on climate change, the growing tenctacles of trickle-down economics, the heinous violence in the Middle East, the resurgence of overtly racist politics and the debacle that was the U.S. Presidential Election (I felt the Bern), I was emotionally spent by the end of the year. I must admit that I underestimated the toll all of this had on my wellbeing. For the first time in years, I reached a point where I detected a sense of dread as I contemplated what was in store across 2017. Not simply because of the likes of Trump taking office, but because of the apparent trajetory humanity is charting. Perhaps this was punctuated as I watched 'Planet Earth II' towards the end of the year, soaking in the glory of our ecosystems. All the while knowing that virtually all of what I was marvelling at, is on track to be lost within a decade or two. Unless of course, we change this flight path. This year I have been reminded of how fast hope can evaporate. Particularly when the challenges to both people and planet require systems change. When you work at the grassroots but know that so much more could happen if policy and investment was driven by public interests. Not the greed of a morally unconscious few. When the levers of power appear to be tainted and tilted well beyond our grasp. When people succumb to triablism and other forms of divison. When you are sensitive to the injustices of the world and the cost of each backward step. Especially as many of our freedoms, though we are quick to forget, have been pried out of the hands of oppressors. There's the rub though. Our history as a species has been filled with struggles for progress. Filled with regressive marches backward that are only recognised for their depravity in the ensuing years. Filled with unlikely victories when destraction and division lose their hold. Thankfully, over these last few weeks , I've slowed down, settled into my bones and found a sense of calm again. I've been offered gentle reminders of my responsibility. To join waves of resistance against injustice in Australia and beyond. To lend my voice to new ways of being in the world. To be among those who are creating and strengthening new stories for our species. I am not brimming with hope, nor am I huddled in the shadows of despair. I am somewhere between, determined to champion what I value. Not out of a sense of burdensome responsibility or the assurance of any success, but because I know of no other way to live. A reflection on the struggles of an activist. Could there be beauty in catastrophe? 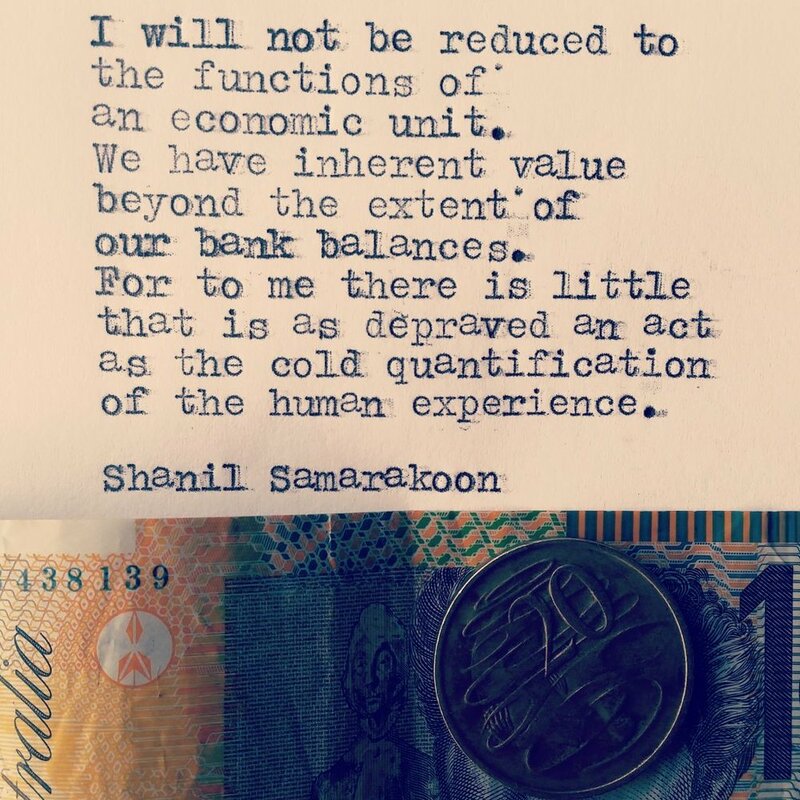 "I will not be reduced to the functions of an economics unit"
I fear cold certitude more than I do the smoke of doubt. Is it not both humble and honest? of what we have known. There is a claim that is attributed to Plato- "the unexamined life is not worth living". While one might argue that this claim is laden with rhetorical flair, it is a nonetheless one that resonates with me in that I feel that it stresses on the importance of making conscious, value-based decisions in our lives. This is without doubt an life-long process, one in which we have to consistently check in to gauge whether we are leading lives in alignment with our values. 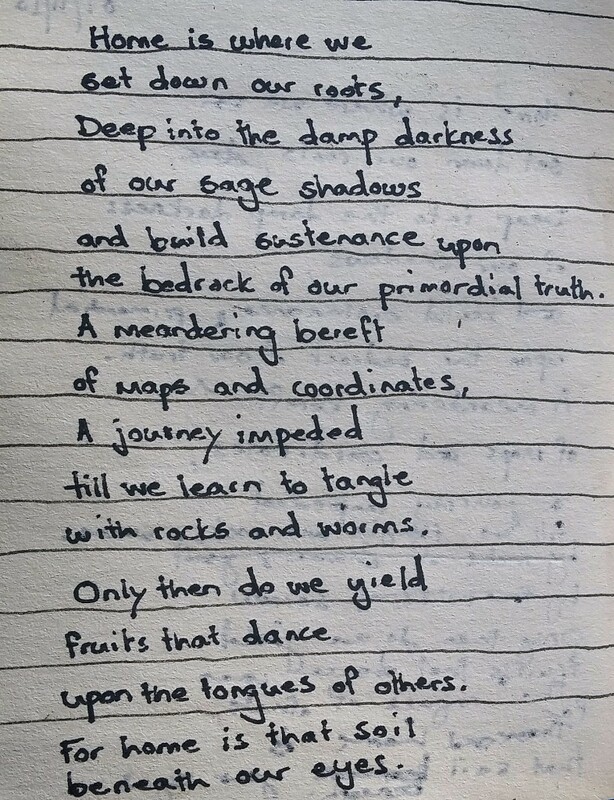 Where we may have to shift our stances and practices in light of new knowledge and/or shifting circumstances. As a leader of a sustainable development organisation and an academic involved in furthering ethics and sustainability education, I'd be amiss if I did not scrutinise my own actions (or inaction) as an individual. What I intend to share with you through this post, is a window into some of the key ethical choices I have made and some of my (many) failings. I would like to state from the onset that these choices are ones I have made in accordance with my values, my lived experience, conversations with others and secondary research. As described earlier, this has been an incremental process, layers built over several years of self-examination. 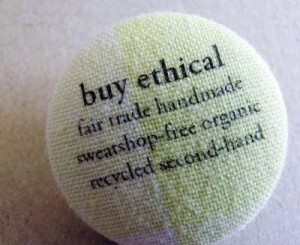 I do not intend to contend that these are THE ethical choices that individuals need to make. Rather, I am more interested in a genuine exploration of the alignment between ones espoused values and the actions we do or do not take part in. It is my hope that this window, admittedly focused on the practicalities of daily living, provides some food for thought ...perhaps even some inspiration for action! For the sake of simplicity, I will divide this entry into two main parts - "The Aligned" and the "Misaligned", though as is often the case in life, there are instances where there is both alignment and misalignment within the same category! As I come from a family of teachers and have had (for the most part), a Buddhist upbringing , the value of service to community was instilled in me from a very young age. In Sri Lankan culture, there is a concept called Sharamadana which translates to "sharing ones time, thought and energy for the welfare of all". Volunteering is a key manifestation of this intent. This is an aspect of my life that I feel is well aligned. Thus far I have contributed thousands of hours of voluntary service to various community initiatives, the establishment and management of Empower Projects and mentoring both students and social entrepreneurs like Nathan Basha. Beyond it being a point of personal pride, I sincerely feel that these hours have been some of the most fulfilling hours of my life thus far. My personal approach to life is centered on an intention to live a life of contribution. This is an area of deep significance to me as I've had the benefit of some wonderful friends in several countries that have helped me overcome many personal challenges. In fact one reason I feel particularly strongly about cultivating strong friendships is because I suffered from depression (mild) in my undergraduate years. Without descending into great detail, one of the driving forces behind me overcoming this, was the presence of friends who were open to real conversations. What do I mean by "real"? Well conversations that transcend polite niceties, forced positivity or mundane (in my view) exchanges of pop culture. Ones in which I could express myself freely, especially if I was despondent or upset without feeling as though it was an imposition, a "buzz kill". As such I am very conscious of making time for my friends and forging honest relationships. I am fortunate that I have many good friends, but I have fairly clear circle of friends that I meet regularly to check in and even use tools like this to discuss our life goals and challenges. After all, how can we be good friends without supporting each other on our respective journeys? Helping my friends make their aspirations and challenges explicit has been very valuable and often strengthened our commitment to each other. More generally, I am a heavy user of social media and while that does come with its own challenges, its been a useful way to connect with friends overseas and to be accessible to those who might need someone to talk to. To date I don't believe I've ever failed to respond to someone who needed to talk and I never intend to. A huge part of our lives and one mired with ethical considerations! This is a facet of my life that I am yet to perfect in terms of alignment but I will acknowledge where I feel I am doing well. I am a permaculturalist and as such I am an advocate for locally grown, organic produce. This video by Michael Pollan does a great job of sumarising my stance. 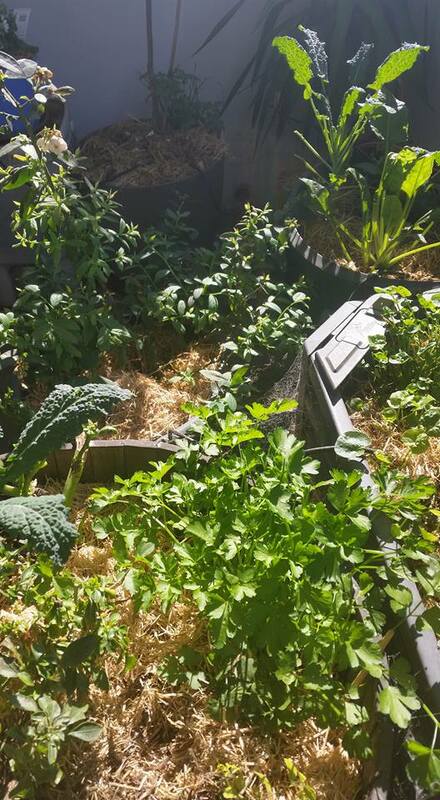 1) growing as much of my own food as possible. 2) Purchasing as much local produce as possible. I've been especially successful with 1). We live in an apartment at the moment but grow enough herbs and salad greens to have a salad everyday! Yes. It is very possible. There's so much you can grow in a small space and there are plenty of resources out there to support you. I'm happy to be of assistance if you ever need any guidance. Beyond the environmental and health benefits , anyone who grows anything will attest to how deeply rewarding it is. There's been research to suggest that gardening has many mental health benefits as well, particularly when it is a communal /shared activity. As for 2) this is a work in progress. While we do purchase organic produce, palm oil free, free range and fair-trade wherever possible, we need to improve upon where we purchase the majority of our fruits and vegetables e.g. local grocers vs supermarkets. The main "reason" here is that of convenience given the busy lives we lead. Yet from experience, this mainly a matter of creating a new habit. I am a supporter of renewable energy and I have been involved a range of renewable energy projects overseas for over 7 years now. As such the fact that I was still reliant on fossil-fuel based sources for electricity was a source of shame and frustration for me. We made the shift to PowerShop and now have access to accredited green (wind) power through this disruptive new business model. While it is a far superior alternative to the AGL connection we had previously, there is still the matter of us using gas for cooking and heating. These are largely limitations tied to living in an apartment. I harbor the hope of owning our own property and being able to generate and manager our own power. Again, my permaculture background has shaped my thinking around waste. I'll speak beyond the recycling plastics here. It's estimated that up to 50% of our household waste and 30% of our waste overall is organic. This is "waste" that can easily be converted to soil so that nutrients are cycled back instead of being concentrated in a landfill. I could nerd out about the specifics of organic waste but I'll hold back! 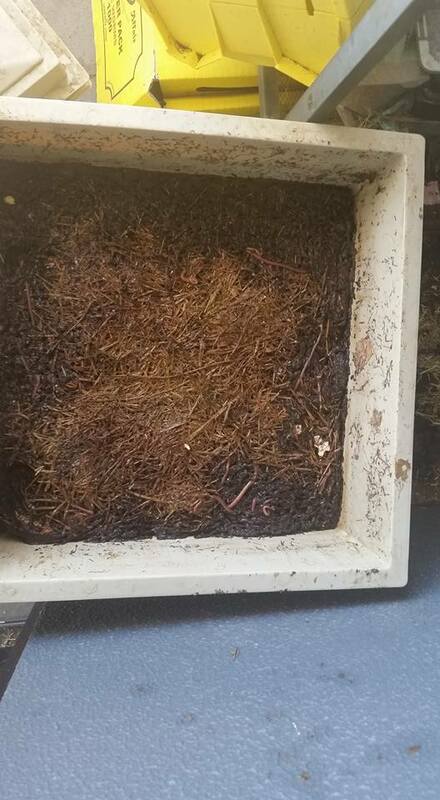 Over the last 5 years I have used either a Bokashi Bin or a Worm Farm to process our food waste (everything except bones). I can safely estimate that I have been able to divert over 5,000 kgs of food waste from landfill. Better yet, I have used this as soil for my garden beds or those of friends and family. There's still the matter of human waste and once again, come the day I have my own place, composting toilets is certainly an important consideration. As grossed out as you may be, the reality is that our urine in particular ...is an incredible source of nutrients for our soil. My partner owns a car but I do not. Virtually all my commutes to and from work are on public transport ( I get a lot of reading and writing - like this blog- done along the way). I'm accustomed to it despite all the flak Sydney's public transport gets. Having had to wait for buses for hours and endure consistent breakdowns in other parts of the world, I have thick skin. I must add that I've had some fascinating conversations with strangers on public transport. Most notably a Syrian refugee that I sat next to one morning. My partner and I also make it a point to cycle or walk to nearby locations for e.g. if we have some light shopping or want to grab lunch at a local restaurant. The added benefit being that we get to spend more quality time together. My policy with technology is that I should be able to justify the utility of each purchase with at least one other person and that I/we need to use that item e.g. TV, a phone, laptop for at least 3 years. I try to obtain second hand items where possible and aim to re-use all technology. For instance approx 75% of all Empower Projects' gear are second-hand items that are in great working condition e.g. computers, phones, tablets. Reduced consumption and re-use trumps recycling. I was a Commonwealth Bank of Australia customer for many years but decided to make the switch to a more ethical option. Primarily as I am a supporter of the fossil fuel divestment campaign. You can use 3rd party sites like Market Forces for an analysis of where your bank invests its money. Personally, I wanted a fossil free option and opted for Bendigo Bank as I also believe in community banking. This is wonderfully aligned with my values as the organisation I lead, Empower projects, is a big proponent of community banks and cooperative models. My excuse for a while was that it was 'too cumbersome' to switch but in actual fact, it only took me a few hours to make the switch and about 2-3 weeks to shift across everything I was using my CBA account for e.g. direct debits. The process was painless and it's very satisfying to know that my pay and savings are being used for good! 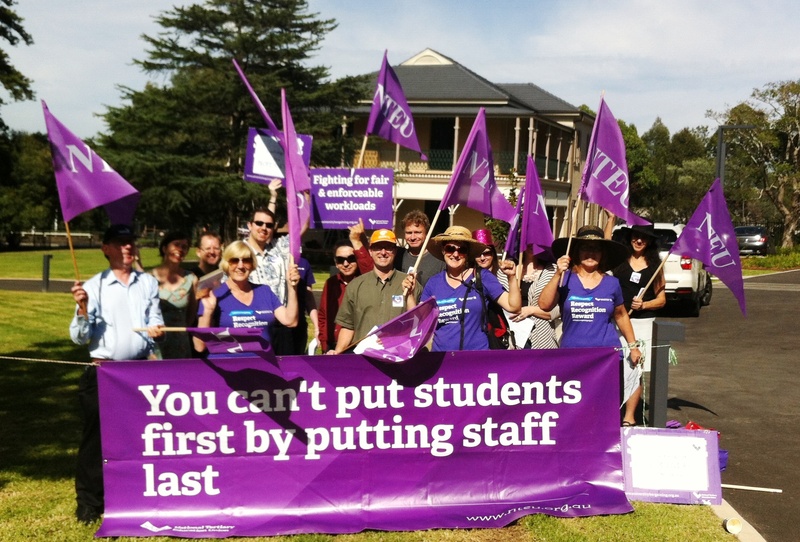 A more recent move I've made is to join the NTEU, the main union for universities in Australia. Amidst the often ideologically driven criticism of unions, history would suggest that unions have been a critical champion in protecting worker rights, benefits and the creation better workplace conditions. In fact much of the basic worker rights we take for granted today e.g. work hours, weekends, pay increments, anti discrimination policies, paid leave and OH&S have been championed by unions around the world. I feel a responsibility to support the growth of the union in my vocation as a weak union would diminish the voice of staff and the standard of accountability to which a firm would be held. Suffice to say, any organisation is susceptible to malpractice and I am an advocate for any organisation being transparent and accountable to its stakeholders, this naturally includes unions themselves. Incidentally, for those who don't know, the membership fees for unions are tax deductible. Believe it or not but a year ago I was an active user of an Aldi Coffee Capsule machine. It was a guilty pleasure, my key 'reasons' being 'taste and convenience' and while I did empty each pod of its spent coffee (into my garden) and recycle each pod ...it was not a sustainable practice. I made the switch to Republica Coffee (Fair Trade & Organic) and in a move that would no doubt please my Italian in-laws, I now use a Moka Pot (Stove Top Coffee Maker). Note Republica do make biodegradeable capsules, but i'm happy with the switch. Nice and simple, more sustainable and cost-effective. I even bring most of my coffee in a small thermos to work, thus minimising the need to purchase coffee from cafes on campus. This is a big consideration that I have long put in the "too hard" category as it involves a fair bit of back and forth with HR in my instance (I won't get into the details). Having said that, this is one of the biggest chunks of money that is invested on my behalf and I feel an ethical responsibility to consider stewardship of these funds wisely. Particularly with respect to investing in fossil fuels and privately-run detention centres. As with my banking, I opted for a fossil free option using SuperSwitch to select Future Super as my choice. Another major area of my life that is somewhat misaligned at the moment. I grew up eating next to no red meat and a largely vegetarian diet. I have also had a few stints at being a vegetarian and a vegan but I cannot say that I am either as a firm lifestyle choice. This is a very contentious area from an ethical perspective but even if you feel that it isn't unethical to eat meat from a rights perspective (provided they are treated humanely), there is a very strong argument to be vegan or at least vegetarian from an environmental perspective. But while I mainly eat fish and chicken (less resource intensive), I do so knowing that it conflicts with my values, particularly the protection of the environment in this instance. I have become more conscious of the % of vegetarian and vegan meals that I have every week and I am fighting my reasons and rationalisations by educating myself e.g. "Once in a while is ok. We're omnivores" , "I do so much. I need the energy. Vegetables and grains alone are not enough" or "I'll have to give up those dishes I love". The transition has started and I recognise that its smarter to do this in manageable phases. Coming from Sri Lanka (where there is a lot of garment production), it is easy to take the availability of cheap clothing for granted without questioning the source and the implications of their low cost. While I have become more conscious of the brands I purchase in Australia post Rana Plaza and tend to wear my clothes thin (at times to my partner's embarrassment) , I feel I need to exercise greater scrutiny. For instance it is not just the matter of the working conditions of workers but fairness in terms of pay and the sourcing of materials e.g. cotton. I came across this great app that is due to be released this year called Good on You and a handy newsletter called Otter by Ethical Consumers Australia that may be of use to others like me who face challenges in being able to discern how different brands rate in terms of their practices. This is a difficult one for me! I run a for purpose organisation overseas, have family overseas and am in a relationship where we both want to see as much of the world as we can before we settle down and potentially start a family. We have now set up Empower Projects so that I am only required to make annual trips and that too is going to be extended to a trip every 18 months. My mother lives on her own so I feel it is difficult to compromise on making less than an annual visit to see her in Sri Lanka but I have plans to bring her over to Australia in the next few years which could reduce the need for me to travel as often. As for travelling beyond, we will look into staggering visits, carbon offsetting and focusing on greener options in-country. As an indie writer myself, I feel I could be doing more to support local artists. While I feel I do a good job of purchasing goods from artists when travelling, I could be doing more to support local artists in Sydney. For instance I rarely attend events or promote the work of my contemporaries and can be rather focused on my own craft. Knowing the challenges of independent artists, I feel that I need to lead by example and commit to looking beyond my craft and actioning greater solidarity with fellow writers and poets at the very least. The main excuse here is "time" , one of the most common and formidable reasons for inaction. I make annual goals and I am a big believer in "if its not measured, it doesn't get done". I will set a goal of attending at least 3 events a year and giving other writers a shout out on my social media platforms at least once a month. Well...that's the end of this (limited) window into my ethical choices! I hope it has been of value to you. Please feel free to ask questions, make comments or offer suggestions. I remember being described when younger, As being "intense" in euphemistic vernacular. An ancient drum beat heart,tuned to mother's rhythm, Our sound travels through this sea's caress in waves, Soft against new skin. Ripples of wonder in dark sanctuary, Of my lot in the world outside, Between love and indifference, till flesh and time collide. A return to forgetfulness, a new seed of the universe, Yearning to be expressed, felt, heard and caressed. Mother... Father.... Oh the dreams I've searched for your hands. It would seem that at the heart of the human struggle to evolve is a primal lust for control. The most pervasive being man's relationship with nature. We live in an insidious paradigm that seeks to subjugate and extract the essence of the ecosystems that support our very existence. Confident in our arrogance of no repercussions. The spirit of an aggressor captured in the words of Francis Bacon "For you have to but follow and as it were hound nature in her wanderings". Brother...My eyes swim in a retreating light, between the shadows of our twin plight. Our hearts gripped by winter's collar, Furious and blind, bleeding summer. I ache for a return to those times, When as brothers we'd trace those hills and rooftops, unknowing of this end. For were our lives not writ with the ignorant ink of men? Wrapped in traps of intellect, Wearing muted masks to cast illusions of strength that fool none. Hostage to our tragedies, Only to find fleeting solace, at the bottom of a bottle, estranged from feeling. Yet even as we raised our walls and our voices, We were loved... By the casualties of our silence, Beyond our deepest afflictions. There's deep insight and inspiration contained within the modesty of a single seed and thus a reverence we owe to each fallen tree.